Marvel Studios have released a trailer for the upcoming second episode of Ultimate Spider-Man, which begins January 21 on Disney XD. The series will air as part of a Marvel Universe-themed programming block including Avengers Assemble (a new series designed to replace Avengers: Earth's Mightiest Heroes) and Hulk and the Agents of S.M.A.S.H. Those new series are expected to debut sometime in the spring or summer, after having been teased at San Diego Comic-Con International this year, where test animation of the new shows was shown to audiences at the Marvel Television panel. 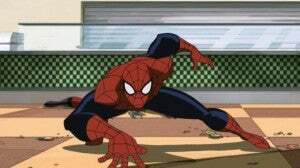 Ultimate Spider-Man will reportedly share a continuity with Avengers Assemble, opening up crossover possibilities. Previously, Ultimate Spider-Man has had everyone from Spider-Ham to the Guardians of the Galaxy on the series. Check out the official description and video below!